I’ve always heard about the many things you can make with seitan. I just never got around to making anything until recently. It’s fairly easy to make a stir fry, so that’s just what I did using a couple summer veggies. Marinate seitan in bowl with 2 tsp of light (or regular) soy sauce. Heat wok to high heat. Add 1/4 c of peanut oil. Just when it starts to smoke, add seitan and quickly add 1 tbsp of shaoxing and 2 tbsp of light soy sauce. Stir fry for 3 minutes then remove seitan and set aside. Add a couple more tbsp of peanut oil to wok. Add the mushrooms and stir fry until the water has cooked out. Set aside. Add peanut oil. Stir fry zucchini, pepper, and peas for about 2-3 minutes. Set aside. Add peanut oil. Stir fry garlic and ginger quickly, not allowing it to burn. Add all ingredients that you set aside. Stir fry for 5 minutes. My apologies if this is very, “saute then remove, saute then remove.” I just couldn’t fit all the ingredients in the wok at once. If you are using less veggies you can probably combine a lot of the steps. I never quite put in enough time into making a salad until tonight. I feel that most of my dishes have meat of some sort, and I would really like to try cooking with veggies much more often. 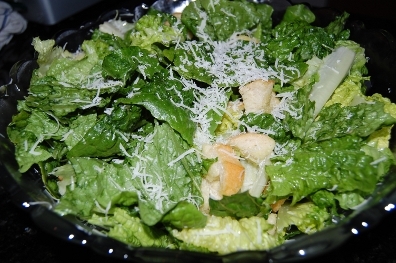 With this in mind I made a caesar salad. First, mix together the garlic and oil and let sit while preparing the rest of the dish. Arrange baguette slices on a baking sheet lined with parchment paper. Baste the slices with a little bit of the garlic oil” and toss in the oven under a broiler (I used the high setting). Keep checking to look at the color of the slices. Take it out once it starts to brown. Once cool, slice into rough cubes. Crack the eggs into the oil bowl and place the anchovy paste too. Whisk the mix until it becomes creamy. Place half of the parmesan cheese in and whisk. Add salt, pepper, and lemon juice to taste. Take the heads of lettuce and break off 1 1/2″-2″ pieces with your hands working from top to bottom. Place the broken pieces into a large bowl (capable of holding all the leaves and tossing). Pour the dressing over the leaves and toss with your hands. Add the rest of the parmesan and bread, then toss again.